I had promised myself two book treats over Christmas. 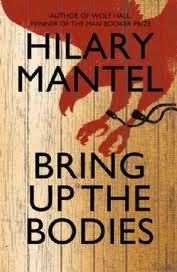 One was Rhys Isaac’s The Transformation of Virginia and the second is this one- Hilary Mantel’s Bring up the Bodies. I had purchased it the very week that it became available…and of course it has sat on my bookshelf unread ever since. I loved Wolf Hall, the first book in the series. It was one of those engulfing reading experiences, where you don’t want to pick up another book for days afterward because everything else will look sallow and weedy in comparison. I must admit that I haven’t been quite as blasted-away over this second book, but it is still a damned fine read and it had me sneaking away to grab 15-minute reads whenever I could. It is written in the same second-person present tense voice as Mantel used in Wolf Hall– naturally enough, because it is a sequel. It is at times a little ungainly: in a conversation between several men, she had to qualify “he-Cromwell….” when there were a few too many he’s around. I found it distracting in the first book, but I fell more easily into it this time, and found that it served to evoke memories of the earlier volume. That’s the problem with the second book in a trilogy that is published several years after the first: how can you remind the reader of what occurred earlier without burdening the book with flashbacks, and yet bringing new readers, unfamiliar with the earlier volume, along with you? I found this with Amitav Ghosh’s River of Smoke, and vowed then never again to read a series until it was completed. Ah, but this is Hilary Mantel, and she struck just the right balance- and I think that her continued use of this unconventional narrative voice assisted her. Thomas Cromwell is the main protagonist of this book as well, and while he continues to be a complex, conflicted man, you see the cold steel in him as well. In the earlier book, Cromwell had negotiated Henry’s divorce from Katherine of Aragon in order to marry Anne Boleyn. In this book, Henry has turned against the Boleyn marriage, and Cromwell again needs to shift and manipulate the pieces into place to meet the king’s desires. The Henry/Anne story has been told many times, but not as quietly and with such menace. Small events and conversations flit in and out, and it is only later in the book that you see them woven into the sticky web of coercion, blackmail and power that Cromwell so quietly and ruthlessly uses to immobilize his enemies. Mantel helpfully provides a very good ‘who’s who’ at the start, arranged by place and allegiance. I found myself referring to it often- maybe a little too often- but perhaps that reflects the nibbly way in which I read it, even though I would have loved to have read it in one big gulp. Was it better than Wolf Hall? I don’t think so- Wolf Hall was so big and so different that I don’t think any sequel could continue at the same intensity without becoming a parody of itself. This book is tighter, more claustrophobic and more chilling. Can’t wait for the third. Read because: I knew that I would enjoy it and wanted to relish it. Sourced from: my very own bookshelf.